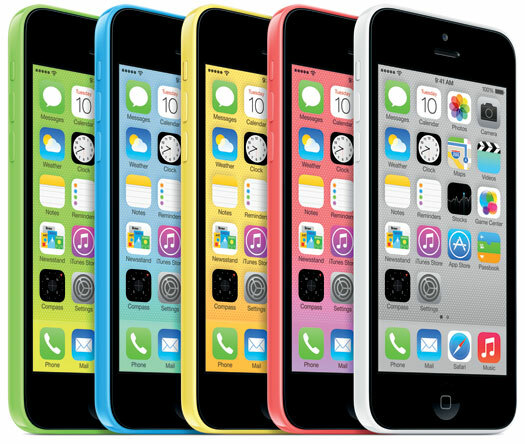 What are the differences between the iPhone 5c & the iPhone 5s? With a quick glance at the front of an iPhone, it would be easy to mistake them for one another, but with more detailed evaluation, some differences become readily apparent. Other differences aren't obvious but still are important. Perhaps the most immediately noticeable difference is that the iPhone 5S doesn't have a rounded square icon on the home button like the other ones. Instead, it has a icon-free & less concave button with an embedded 'Touch ID' fingerprint sensor. Consequently, the iPhone 5S can be configured with biometric identification rather than just a pass-code. Although the specific parts are different, the iPhone 5, iPhone 5C, & iPhone 5S all have a 4" multi-touch IPS LED-backlit 1136x640 "326 ppi" "Retina" display & the front of each is glass. Otherwise, the housing is quite different, particularly for the iPhone 5C compared to the other 2 models. The iPhone 5 & iPhone 5S both have a largely aluminum 0.30 of an inch thick case with a 'chamfered cut' band around their edge, but the matte color options are different. Specifically the iPhone 5 has either a black glass front & a mostly black aluminum back / a white glass front & a mostly silver aluminum back. The iPhone 5S models also are offered with a white glass front & a mostly silver aluminum back but Apple replaced the black glass & black aluminum option with a black glass & medium colored gunmetal gray aluminum option that the company refers to as "Space Gray." 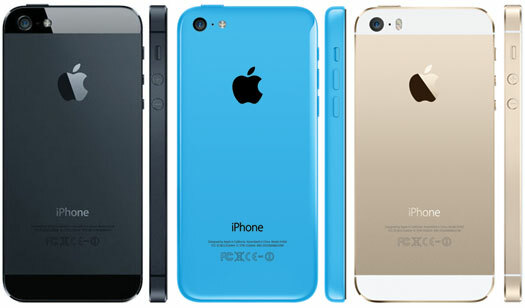 Apple also has added an all new -Gold- option with a white glass front & a mostly gold colored aluminum back. The iPhone 5C models -by contrast- are offered with a new poly carbonate over steel body design in 5 glossy colors (white, pink, yellow, blue & green). The iPhone 5C also is a bit thicker & heavier than the iPhone 5 & iPhone 5S. Most notably, the iPhone 5C is an extra 0.05 of an inch thick & weighs an extra 0.7 of an ounce. All these 3 models (iPhone 5, iPhone 5C & iPhone 5S) additionally have a bottom mounted microphone, headphone jack, Lightning connector & a single built-in speaker. They all have Ear-pod headphones that include the integrated Remote & Mic, too. The front FaceTime cameras are similar in all three devices (iPhone 5, iPhone 5C & iPhone 5S) & all have 1.2 megapixel sensors & shoot 720p video, but the iPhone 5 has 1.75µm pixels whereas the iPhone 5C & iPhone 5S have 1.9µm pixels, means that in the real world the later models have improved low light performance, even if it can be subtle. The back "iSight" cameras for the iPhone 5 and iPhone 5 are the same. Both shoot 1080p video and have an 8 megapixel sensor with an f/2.4 aperture, 1.4µm pixels, a five-element lens, a sapphire crystal lens cover, a single LED flash & a hybrid IR filter. They both also support auto focus, tap to focus, face detection, Panorama mode & photo geotagging. The back camera for the iPhone 5S is of significantly better quality even though Apple still dubs it "iSight" like the lesser models. It also has an 8 megapixel sensor but it has 1.5µm pixels, for more detail & clarity. It also has an f/2.2 aperture ,for more light, & a dual LED flash that Apple refers to as "True Tone." Apple claims that the True Tone flash provides more natural light than a traditional flash by variably adjusting "color & intensity for over 1,000 combinations." The iPhone 5S has all of the other hardware & software features of the iPhone 5 & iPhone 5C camera but also adds a "Burst mode" for still photos & a "Slo-mo" mode for video. 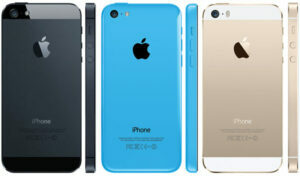 At the moment, it is simple to visually identify the iPhone 5, iPhone 5C & iPhone 5S when all are side-by-side. The iPhone 5C is the only colorful poly carbonate one and although the iPhone 5 & iPhone 5S share very similar cases, the iPhone 5S can be spotted quickly by the distinctive "Touch ID" home button. However, visual identification may be more challenging in the future & particularly when the devices aren't next to one another. Many of the devices can be identified by Model Number, which is listed on the back of each phone in a very tiny type, but not all can be individually identified in this way. Apple reports that all 3 of these iPhone models (iPhone 5, iPhone 5C & iPhone 5S) provide up to 40 hrs of audio playback, 10 hts of video playback & 10 hours of Wi-Fi, but provides different numbers for other usage. Specifically, Apple estimates 8 hrs of talk time on 3G & 8 hrs of Internet use on 3G & 4G/LTE alike for the iPhone 5, but 10 hrs for the iPhone 5C & iPhone 5S. The iPhone 5C & iPhone 5S models have a larger capacity battery than their predecessor, so it is entirely logical that the battery run-time is longer. All iPhone 5, iPhone 5c & iPhone 5s models support GSM/EDGE (850, 900, 1800, 1900 MHz). With the official exception of the China Unicom & China Telecom models, all three lines support 4G/LTE, but different models support different LTE bands as well as other connectivity standards. The iPhone 5 & iPhone 5c are both powered by a dual core 1.3 GHz Apple A6 processor & have 1 GB of RAM. 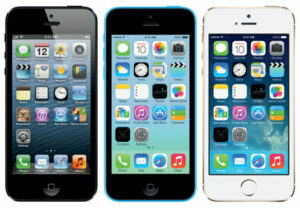 The iPhone 5 and iPhone 5S have 16 GB, 32 GB, or 64 GB of flash storage whereas the iPhone 5c only have 8 GB, 16 GB, or 32 GB. 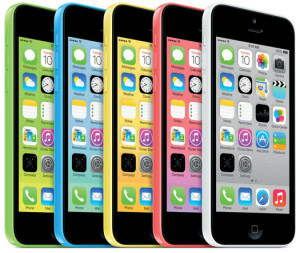 Originally, the iPhone 5c models shipped with 16 GB or 32 GB of storage but on March 18, 2014, Apple added an 8 GB option, only in the UK, France, Germany, Australia & China. On April 16, 2014, as first spotted by 9to5Mac, Apple quietly added the 8 GB iPhone 5c model in Austria, Belgium, the Czech Republic, Denmark, Finland, Hungary, Italy, Ireland, Luxembourg, the Netherlands, Norway, Poland, Portugal, Spain, Sweden & Switzerland. The iPhone 5 models fully support both iOS 6 & iOS 7 but the iPhone 5c & iPhone 5s models only support iOS 7, without any support for earlier versions of the iOS. Regardless of OS, it also is worth noting that FaceTime audio doesn't work on the Chinese models due to state restrictions on VOIP services. Now which one should i buy? The iPhone 5, iPhone 5c & iPhone 5s models all are quite capable & the decision likely will come down to whether performance, appearance / price are most important to you. If upfront price is not a concern, you want your iPhone to be usable for as long as possible from the date you purchase it & both speed & camera are important to you, the iPhone 5s is the clear choice. You also may find the iPhone 5s the best choice simply because you like the "pimp" gold color option or you find yourself forgetting your passcode on a regular basis & a biometric fingerprint unlock option would be particularly handy. If upfront price is more of a concern or you like a bright "candy colored" design & performance & the camera are less important, the iPhone 5c is a solid choice. Of course, internally, the iPhone 5c is quite similar to the iPhone 5 & if you prefer a more subdued design & an even lower price tag on the used market, the iPhone 5 remains well worth consideration, too.